What’s the Matter With San Francisco?The most architecturally impoverished of America’s great cities lays an organic, free-range egg. It’s lovely, the city by the bay. But perhaps the perfection of its natural setting has made it a little lazy, for in terms of architecture, this city has never really carried its weight. To be sure, San Francisco has remarkable vernacular traditions, from its Victorian houses to the vaguely Mediterranean and Deco tendencies that give its neighborhoods so much visual appeal. It has one of America’s finest city halls and the most ethereal of the great suspension bridges. The works of Bernard Maybeck head the list of a collection of wonders from the city’s most creative period, in the rebuilding after the 1906 earthquake. Since that time though, great building never really found a home here. Upstart Los Angeles—horror of horrors—took over the job as the real center for architecture in the West long ago, and San Francisco doesn’t seem to mind. For a city built by rip-roaring miners and gamblers, latter-day Frisco has been a remarkably conservative and strait-laced place as far as the arts are concerned. It should be in the same league as New York and Chicago, but its contributions and its tastes give it a rank among the middling cities—Kansas City, Minneapolis, Pittsburgh. It’s a mystery to ponder, why this delightful and intelligent city’s judgement should be so consistently unsound and unsophisticated. Beginning in the 60’s San Francisco allowed its center and its famous skyline to be ruined by a horde of architecturally illiterate speculative office towers, ranging from the callow frivolousness of William Pereira’s pyramidal Transamerica Tower to the buttoned-down gray hulks that surround it. The Transamerica indeed makes a perfect symbol for this city’s aspirations. Often when San Francisco tries to make a statement, it ends up wishing it had kept its mouth shut. One thing San Francisco will always do is fall for a fad. In the 70’s it was concrete and glass Brutalism. More recently, it has been joke buildings with walls built at every angle but straight, buildings designed to provoke and amuse more than to serve human needs. Among other baubles, San Francisco called in a high priest of the movement, Daniel Liebeskind, to build an indigestible, downright angry-looking addition for the Contemporary Jewish Museum. San Francisco really wanted to make a statement when the Loma Prieta earthquake of 1989 severely damaged two important institutions in Golden Gate Park. 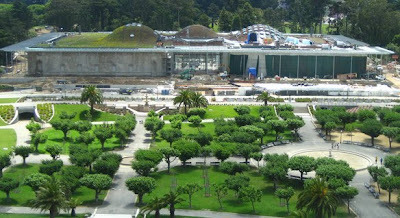 The first to be replaced was the De Young Museum (2005). Herzog and De Meuron of Switzerland, international starchitects since they emptied put an old power house to create London’s Tate Modern, got the call, and they did their best to bring some of the Tate’s incongruous grimness to this lovely park setting. Modernist critics used to accuse the old Beaux-Arts museums as being mausoleums for art. The new De Young too has its tomblike qualities, served up with a vaguely German Expressionist air. Completely covered in rapidly tarnishing copper sheets, it offers crooked walls, a claustrophobic little crooked courtyard, and a huge, menacing crooked tower. Predictably, the highbrow critics praise it to the skies in postmodern jargon. The London Independent’s man called it ‘a new kind of shock and awe architecture’. San Franciscans have called it a lot of other things, most evocatively a ‘rusty aircraft carrier’, but to me it resembles nothing so much as one of the creepy, copper-coloured border security fortresses the British army built in Northern Ireland during the Troubles. All that’s missing is the razor wire. 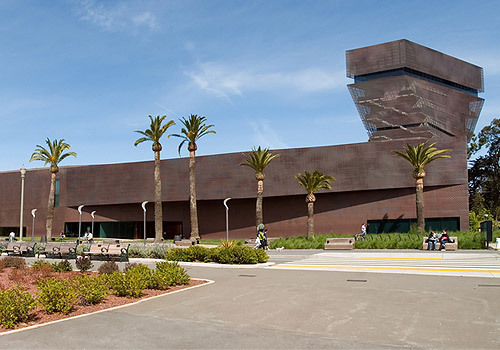 Looking back, the De Young is so 2005. Today, the fad is ‘green building’—subordinating all the more accustomed desiderata of architecture to energy efficiency, and what we might call green publicity. There’s nothing wrong with building sound environmental practice into homes and workplaces. In fact, it’s one of the big stories in architecture today, with new advances and innovations appearing at a dizzying pace. Some features that affect the actual appearance and use of a building, such as ‘green roofs’ that minimize solar reflection and improve the air quality of the surroundings will be influencing everyone’s architecture from now on. That sweet utility isn’t enough for every architect and client these days. Facing the De Young across Golden Gate Park’s Music Concourse is the brand new California Academy of Sciences, which opened last Sept. 28. Here, the starchitect is Renzo Piano. His reworking of the original’s Beaux-Arts façade left the new Academy giving the first impression of an Edward Durrell Stone pastiche, a mini-Kennedy Center. Ah, but look up. Above a tin canopy roll undulating bubbly green hills, sod-covered domes dotted with round windows and planted with 54 species of native California wildflowers. With some robust Mannerist braggadocio, this is Piano’s Italian version of a ‘green roof’. From the air, it could be mistaken for a putt-putt course; close up it looks more like the home of the Teletubbies. All that soil may well be great thermal insulation. And your guess is as good as mine, or the architect’s, as to how many years it will take before the roof starts leaking irreparably. But ask the forward thinkers for a good scientific reason why it is necessary to build a park on top of a building set in the middle of a 1,017-acre park, and you will ask in vain. Equally prominent are the rows of solar panels around the edge. Thanks to the green carpet, they may supply only a paltry 5% of the building’s gargantuan energy needs, but that’s not really why they’re there. Their purpose is to send a message; they are propaganda for the cause. The proponents of this brand of architecture, usually the same ones who were intoning pieties about the need for architecture to be ‘socially useful’ before this latest fad came along, admit as much themselves. Christopher Hawthorne, the L.A. Times’ critic, puts it like this: ‘There is still a need for green design to operate as much on a rhetorical level as a purely practical one’. This, ‘in the interests of progress’. In other words, buildings now have to shout their ecological worthiness to the world. They have to wear it like a scout’s merit badge. The museums of Golden Gate Park got their start with the 1894 International Exhibition. That was a fad too, a hastily-contrived effort designed to copy Chicago’s great fair of the year before. The cheaply-built De Young, housed in one of the Exhibition’s few surviving buildings, was threatening passers-by with chunks of falling concrete frippery long before the Loma Prieta earthquake put big cracks in it. Everyone in San Francisco knew they would have to rebuild both of them some day. They might have replaced them with lasting monuments, as New York or Chicago would have done. Instead, they cast their lot with the obscure prophets of the ironic and ephemeral. For another century yet the good citizens will have to live with a pair of gimmicked-up fair pavilions. Their sell-by date will come sooner than the good citizens think.